This page describes the structure of the AIP produced by Archivematica. Either the name of the original transfer if no new name has been assigned to the SIP upon formation or the name of the SIP or SIPs created from the transfer. A UUID assigned during SIP formation. For example, looking at the AIP name AncientSturgeon-bbabce6e-OO16-4185-a93e-f2dd71bfbb8c, AncientSturgeon is the name assigned by the user and bbabce6e-OO16-4185-a93e-f2dd71bfbb8c is the UUID generated during SIP formation. The AIP is zipped in the AIPStore. The AIP directories are broken down into UUID quad directories for efficient storage and retrieval. The Archivematica AIP consists of Bagit files and a Data directory. The data directory consists of the METS file for the AIP, a README.html file and three folders: logs, objects and thumbnails. /data/METS.uuid.xml contains the full PREMIS implementation (see PREMIS metadata for original file, PREMIS metadata: normalized files, PREMIS metadata: events, and PREMIS metadata: rights). The role of the METS file is to link original objects to their preservation copies and to their descriptions and submission documentation, as well as to link PREMIS metadata to the objects in the AIP. The METS file will have a basic generic structure that will be present for all AIPs derived from different kinds of transfers. Archivematica currently uses METS version 1.11. There may be one dmdSec for the AIP as a whole. Each original file may also have a dmdSec. The dmdSecs are numbered dmdSec_1, dmdSec_2 etc. The dmdSec contains Dublin Core metadata. If the user does not enter any DC metadata during transfer/ingest and no DC metadata was included in the transfer (eg as part of a DSpace export), there will be no dmdSec. 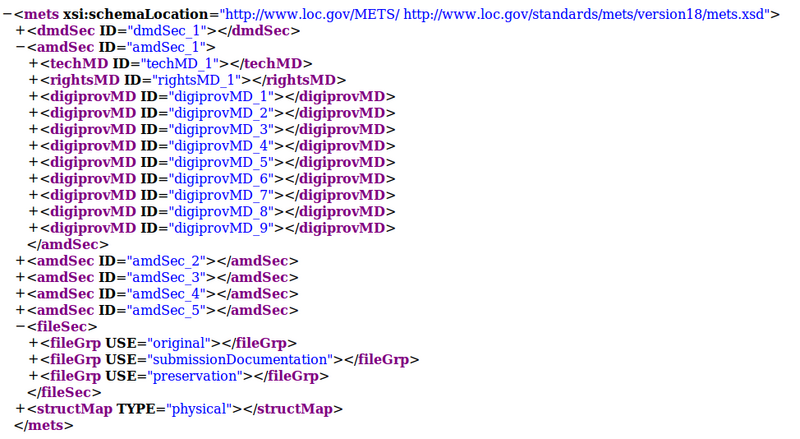 The dmdSec may contain a reference to metadata in another file, such as a mets.xml file included in a DSpace export. There is one amdSec for each object. The amdSecs are numbered amdSec_1, amdSec_2 etc. An amdSec for an original object may also contain one or more rightsMDs. The rightsMD may contain a reference to metadata in another file, such as a mets.xml file included in a DSpace export. There is one fileSec listing all files. Original is required for all METS files. SubmissionDocumentation is included if the AIP includes submission documentation. Preservation is included if the AIP includes normalized files. Service and access may be used if the AIP contains those subfolders - i.e as the output of digitization workflows. License and text/ocr are used if the AIP was created from a DSpace export containing licenses and ocr text files. The first is labeled “Archivematica Default” and shows the physical layout of the files in the objects directory. The second is labeled “Normative Directory Structure” which shows the logical structure of the files in the objects directory. This second structMap is necessary to document empty directories before they are deleted at ‘store AIP’ in the Storage Service. At AIP re-ingest the new logical structMap will be parsed to re-create the empty directories. /data/README.html consists of a human readable file that describes the basic structure of an Archivematica AIP. It consists of Acronyms, Introduction, Content Information, Preservation Description Information (PDI), and AIP structure. /data/logs contains the /transfers directory, format identification log, malware scan log, and the file name cleanup log generated during SIP creation. /data/objects contains original objects, normalized objects, /metadata and /submissionDocumentation. If there were any lower level directories within the SIP, that directory structure is maintained. /submissionDocumentation contains submission documentation for each transfer which is part of the SIP and each transfer’s METS.xml file. The structmap for the transfer is the closest approximation of original order for the transfer, along with the tree diagram if the user chose to create one during transfer. /data/thumbnails contains any thumbnails generated for viewing in the AIP search interface of the dashboard. The creation of thumbnails is optional and configurable in the processing configuration.